This past weekend my wife and I were wondering around Columbia Books 1907 Gordon Street, Columbia MO 65202. (573) 449-7417 www.columbiabooksonline.com when I found a hard back copy of ENIAC. ENIAC (0802713483), by Scott McCartney, is a 256 page book on the story of how the first digital computer was created and how it's creators never received due credit for their invention. In the day of the analog computers, Mauchly's and Eckert's peers neither saw the need for a digital computer nor thought that it was possible to build one. I enjoyed ENIAC enough that I read 80% of the book in two days, but do to events at work I wasn't able to finish it until today. I found Scott's writing style to be both informative and easy to read. Over all, I would highly recommend ENIAC to any fellow computer history buff or anyone else that is wanting to learn more about computer history. 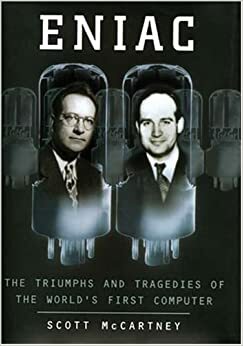 Not only does the book go in to the history of ENIAC, but it also goes in to some detail about the infant computer industry and how things started, including Snow White (IBM) and the seven dwarfs (Burroughs, Univac, NCR, CDC, GE, RCA and Honeywell). Last Modified: 2014-05-08 23:23:24 CDT.